The Worst Witch written and illustrated by Jill Murphy is reissued with exciting new branding and format. 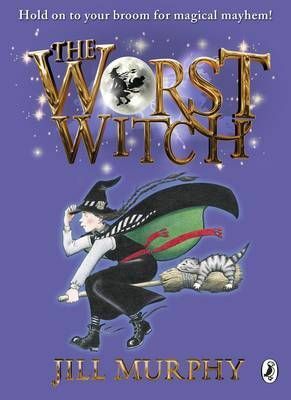 The Worst Witch is the first in the bestselling children's series by Jill Murphy. Hold on to your broomstick for magical mayhem! Jill Murphy's much-loved classic The Worst Witch is the original story of life at a magical boarding school, perfect for readers aged 5 - 9 years. Mildred Hubble is a trainee at Miss Cackle's Academy for Witches, but she's making an awful mess of it. She keeps getting her spells wrong and crashing her broomstick. And when she turns Ethel, the teacher's pet into her worst enemy, chaos ensues..."Millions of young readers have fallen under the spell of Jill Murphy's Worst Witch". (Sunday Express). Jill Murphy was born in London in 1949. From a very early age she was drawing and writing stories, and was already putting books together (literally, with a stapler) by the time she was six. She went on to study at Chelsea, Croydon and Camberwell Schools of Art. Jill worked in a children's home for four years and as a nanny for a year, before becoming a freelance writer and illustrator.The Worst Witch stories, of which this is the first, are some of Puffin's most successful titles. If you'd like to read more of Mildred's disastrous adventures at Miss Cackle's Academy The Worst Witch Strikes Again, A Bad Spell for the Worst Witch, The Worst Witch All at Sea, The Worst Witch Saves the Day and The Worst Witch to the Rescue are also available from Puffin and are perfect for children aged 5-9.